Are you looking for a professional asphalt paving contractor in Bergen County NJ? Call us at (201) 327-5258 today so we can come and provide the solution you need. Asphalt looks great and is highly effective, but it doesn’t last forever. Give us a call when you notice problems starting and we will make them disappear. Find our current online sales and coupons when you click here now. Even though most people take the asphalt under their feet and their vehicles for granted, the value of a good paving contractor in Bergen County NJ can’t be overstated. Proper construction and maintenance of driveways, parking lots, walkways, playgrounds and sidewalks, adds to the safety, the aesthetics and the longevity of each particular surface. No asphalt surface lasts forever, but having a reputable and high quality paving contractor in your corner will help you get the most out of your surface, all year long. Click here if you’re interested in what your neighbors think of our services. It’s no secret that many would-be asphalt and paving customers are scared away by the thought of having to pay for an estimate for a service they aren’t even certain they want. 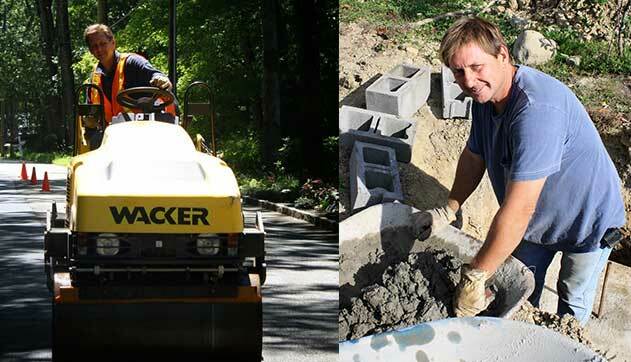 That’s why we insist on offering free estimates for our services when it comes to both residential and commercial paving in Bergen County NJ. This way, you can get an experts’ view of your particular asphalt situation, hear the recommendations and the estimate, with no risk or obligation should you decide you look elsewhere. We believe in providing the greatest value possible, and free estimates are an important part of that scenario. McFarlane Asphalt has a history as a driveway company in Bergen County NJ, being a family-owned business that’s been operating for 20 years. The fact that we put our name on the line each time we provide paving services shows the level of dedication and confidence we have to get the job done right. We aren’t afraid to tackle any type of asphalt paving challenge, and the results speak for themselves. When it comes to services like paving, trust is a huge factor. Even the smallest error in mixing the asphalt, planning the job or applying it to the surface can result in an uneven surface that won’t drain correctly and is damaged sooner rather than later. The McFarlane name creates a feeling of trust and peace of mind, which is why we continue to be such a top choice for residential and commercial asphalt paving in Bergen County NJ. Whether it is a driveway, a parking lot, sidewalk, curb or retaining wall, we have all the answers you need for a fast and effective solution. Call McFarlane Asphalt at (201) 327-5258 when you need a trusted driveway paving contractor in Bergen County NJ and we can get the process started right away.